Like the previous tokens, this was made by William Scovill at the Waterbury Mint. 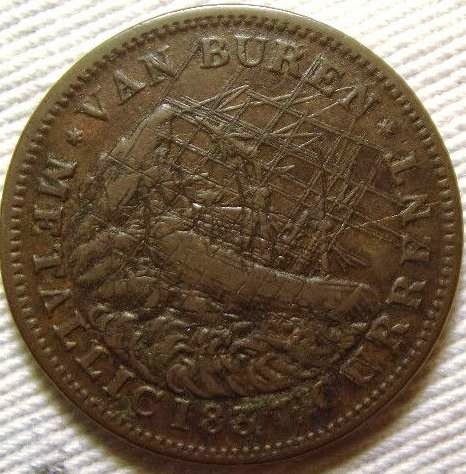 It's political, showing the Ship of State foundering due to Van Buren. Obviously Scovill was not a fan. You can't make it out on this very well, but one side shows a ship named "Constitution" under full sail, while the foundering ship on the other side is labeled "Experiment". The "Constitution" side says "WEBSTER CREDIT CURRENT" and the other side says "VAN BUREN METALLIC CURRENT". bank note not convertible on the spot into gold or silver upon demand. Webster comes into it because he opposed Jackson/Van Buren policies (see Coinage Act of 1834). 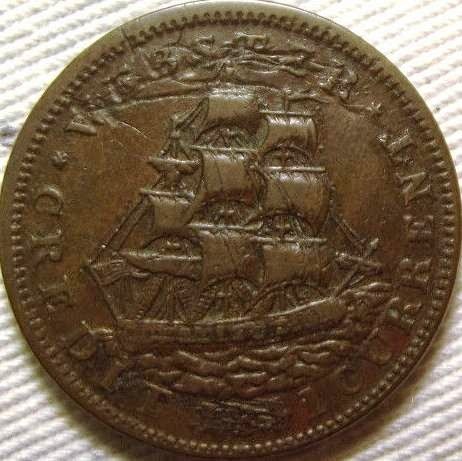 These are a bit less common than other political tokens of the time and some varieties are more rare than others. Quite a few are scratched up like this one; I don't know why. Scovill was arrested on charges of counterfeiting around this time - the charge was based on the "Not One Cent" pieces, not these. Nothing came of it, so it was probably political harassment for issues like this.